Many years ago, back when the world was young, I learned to purl. I was thrilled; I hated garter stitch! I didn’t want to do that lumpy, bumpy knitting. I wanted to do the nice smooth knitting like my Mum did. Grown up knitting. Except my stocking stitch never looked quite right. Then I worked a pattern that required me to do something new: knitting through the back loop. All of a sudden, my stocking stitch looked like proper knitting. I never questioned why this should be. I just accepted that there was something funny about my knitting, but it looked fine if I knit through the back loop. Fast forward about two decades. I was browsing through a knitting book. It was a book I’d had for a while, and it wasn’t the first time I’d looked through it. There was a section at the start on how to knit. I’d never read that section because I’d been knitting for around 20 years, but this one day, I glanced through it; how to work a purl stitch. That’s when it dawned on me. I’d been doing it wrong! For 20 years. The reason I had to knit through the back loop was because I was winding my yarn under the needle when I worked my purl stitches. It was surprisingly easy to change how I worked my purl stitches. I’d expected it to take a while to get used to, but it didn’t at all. I didn’t do a lot of knitting. I became interested in other things, and, for a long time I didn’t knit at all. When I came back to knitting a few years ago, it was very different. There was t’internet – this huge repository of knitting expertise. It doesn’t matter what your question is, what you’re stuck on, pop it into Google and you’ll find several people have written tutorials or articles on it, and some of them will have made a video and kindly uploaded it to YouTube. One of the things that drove me nuts in my knitting was ribbing. 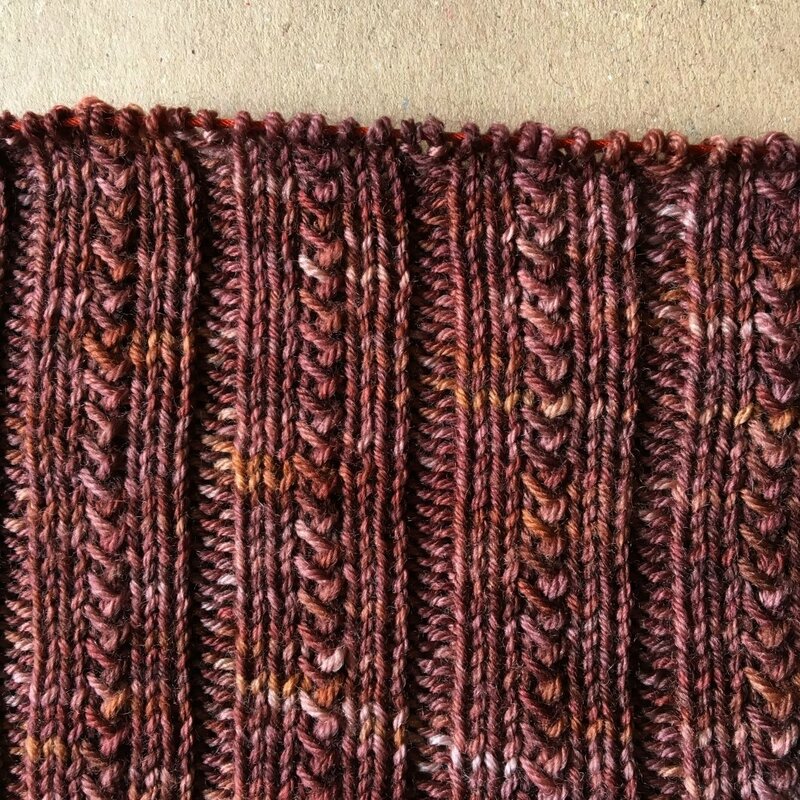 My ribbing never looked nice; the knit stitches, especially on 1×1 rib, always looked loose and sloppy. It didn’t seem to be a tension issue. I am quite a loose knitter, but I could hold my yarn in a death grip whilst ribbing, yanking it tight after every knit stitch, and it made no difference. It’s the reason I started doing twisted rib on my sock cuffs. But Google is my friend. I Googled ‘knitting sloppy rib‘ (and how Google understood that isn’t something I wanted to achieve mystifies me!) and there were lots of articles about how to combat those sloppy knit stitches. It wasn’t just me that had a problem with them. As it turned out, back in the middle ages, I wasn’t purling wrong at all, I was doing Eastern Purl. I tried out Eastern Purls on my most recent pair of socks. As the pattern had wider bands of knit stitches separated by 2 purl stitches , I used them throughout. As you can see from the photo, not a sloppy knit stitch in sight! 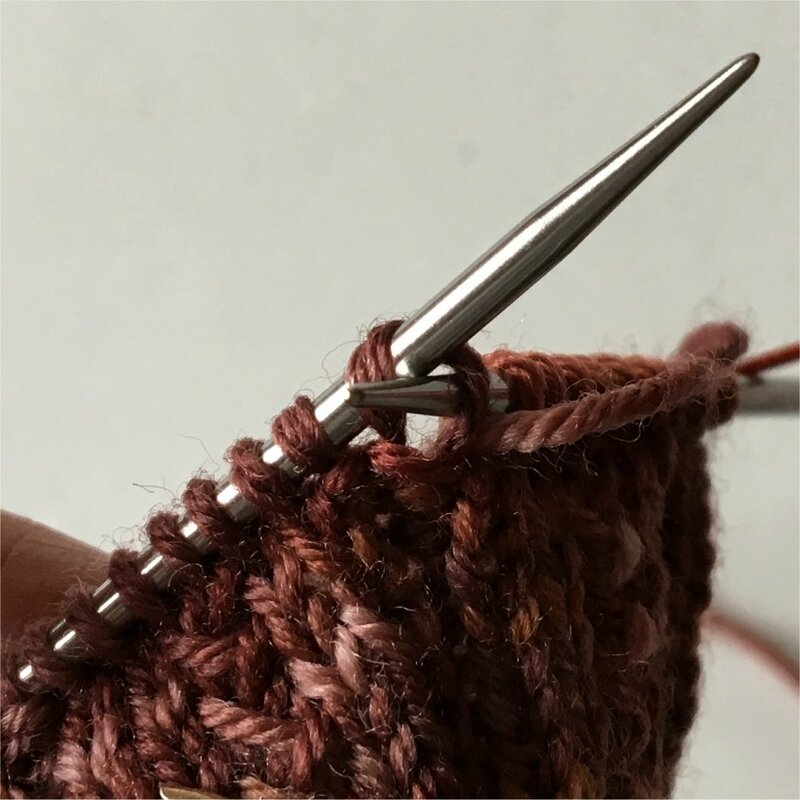 One thing the article I’ve linked doesn’t mention is that when you are working in the round, it’s the purl stitches that are orientated differently on the needle and need to be worked through the back loop. Because the stitch sits differently on the needle, it’s not difficult to remember to do this, and I found that purling through the back loop seems to lend itself to winding the yarn under the needle, rather than over it. For all I was trying to eradicate my sloppy knit stitches, I hadn’t expected the results to be quite so dramatic. I’m delighted that such a simple change has made such a difference. It’s also gratifying to know, after all these years, that I hadn’t been doing it wrong, after all.